Local naturalists are studying the concrete canyon of San Francisco's Market Street, and finding that it provides habitat to some surprising denizens. 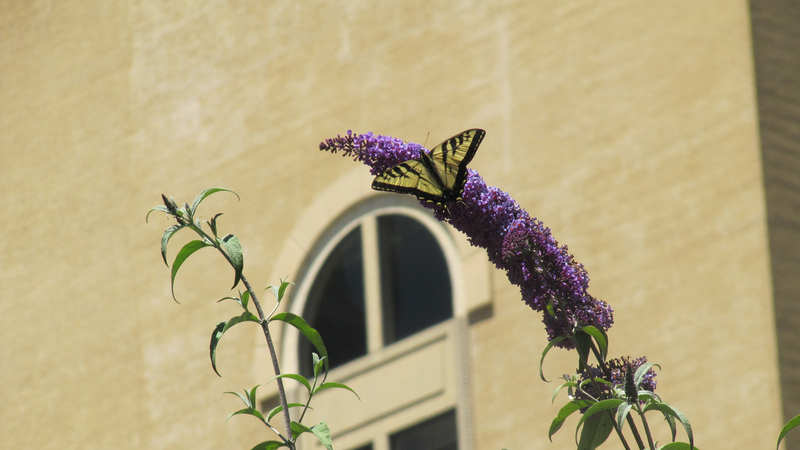 It was a series of "tiger" sightings that sparked the idea -- specifically the tiger swallowtail, a big yellow butterfly that seems to have taken to Market because the street resembles its natural habitat. "This creature likes to go up and down watercourses," said lepidopterist Liam O'Brien, on a recent stroll down one of San Francisco's busiest downtown thoroughfares. "So if you think about a street, laid out in a long line, through the POV [point of view] of the creature, that's the bank of a river," explained O'Brien, who is heading up the project. The London plane trees planted along Market Street are one of the plants that the tiger swallowtails favor for egg laying. And they've developed some urban street smarts, as O'Brien pointed out. "About a year ago, I saw one land on the cut flowers at that stand," said O'Brien. "Imagine that, a creature going to a cut flower stand in a downtown setting. That just blows my mind." He's working on the project with Amber Hasselbring, executive director of the San Francisco non-profit Nature in the City. The two landed a small grant to do the work. 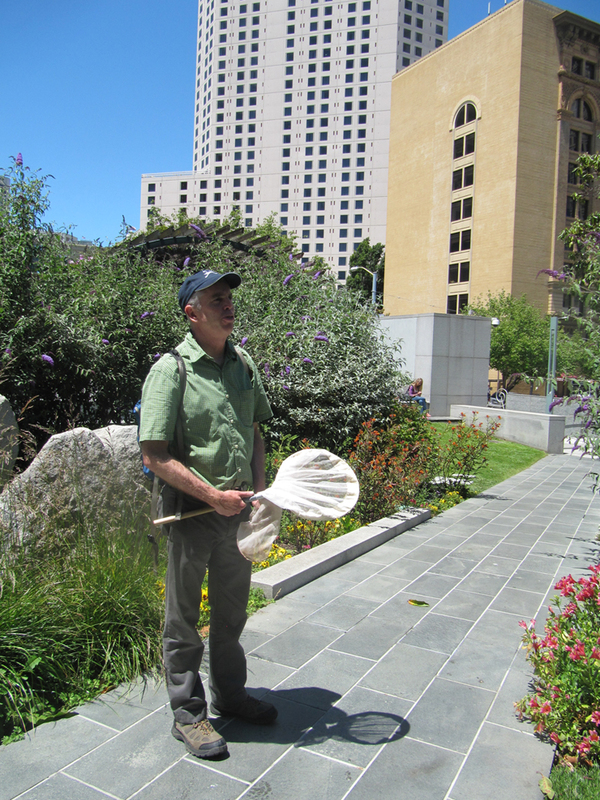 "We're probably the only field people in the country right now doing field work at One Sansome and Market," said O'Brien, surrounded by high-rise office buildings. Sometimes he gets funny looks on his way to work. "Everyone's going downtown, and I'm carrying a butterfly net on Muni at 8 AM." Tiger swallowtails are relatively common in urban areas, but their presence got O'Brien and Hasselbring curious about what else lives here. Now they're keeping track of more insects and other pollinators on Market and in nearby parks. "We've seen a lot of dragonflies, tons of hummingbirds, a lot of different bee species, quite a few different flies and moths, along with some other butterflies," said Hasselbring. It's all about keeping an eye out for wildlife, even in unexpected places, she said. "A lot of times we focus our attention on the places that we know we'll see things," said Hasselbring. 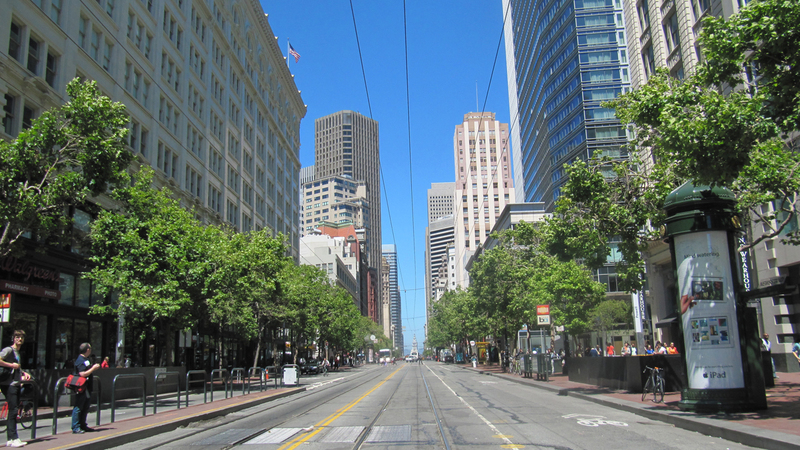 "There's spots that you'll go in San Francisco to see wild nature, and Market Street would not be one of them." And sometimes even these urban naturalists are surprised. The day I tagged along with O'Brien and Hasselbring, they spotted an echo blue butterfly as it landed on a tree in Yerba Buena park. O'Brien said it was his most urban sighting of that species. "How did that little blue butterfly find this ecosystem?" he wondered. O'Brien and Hasselbring hope city planners will use the data they're collecting, and consider the birds and the bugs when it eventually comes time to redesign Market Street, as planned. Meanwhile, until the end of tiger swallowtail season in October, the two will be out patrolling with nets and cameras.